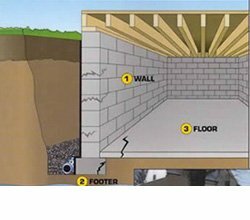 The experts at Everdry Waterproofing want you to understand the importance of basement waterproofing systems. 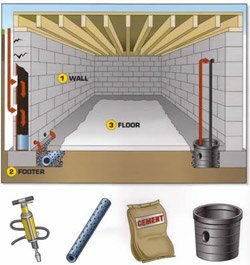 There are many things to understand when it comes to the details of waterproofing your basement. Below are examples of what we do in order to complete the basement waterproofing process. When you have a wet basement, or find water in your basement, it's important to take care of the problem immediately. Don't risk the formation of mold and mildew or the damage of your personal items. Basement waterproofing cost is well worth the health of you and your family. Not to mention your property. Call the experts at EverDry to rid your basement of water today! Excavate to footer all accessible areas. Remove old drain tile & replace with new. Apply mastic sealer to walls. Backfill with stone to within 24 inches to grade. Open floors next to outside walls. Drill weep holes at footer level. Install drain tile surrounded by gravel. Connect drain tile to crock with sump pump. Replace concrete floor where opened. Hand excavate inspection trench(where accessible). Excavate any cracks continuing below inspection trench to their ends.Repair all wall cracks on outside to make wall structurally sound. Apply fibrated mastic (waterproofing) to walls. Apply heavy-duty industrial plastic to mastic forming "J" channel. Install new MDS sub-soil drainage tile packed in gravel. Seal any outside cement if needed. Repair all wall cracks on inside to make wall structurally sound. Open an inspection trench inside using the patented Dust Suppression System. Inspect footers and reinforce where necessary. Repair footer cracks where needed. Install sub flooring drainage system. Replace concrete floor where serviced. Open a hole in the corner of floor. Install perforated plastic crock packed in gravel with safety lid. 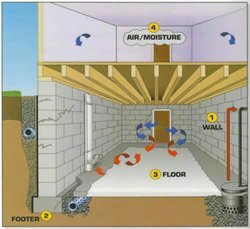 Install Pressure Relief system to effectively lower the water beneath the floor. E-Z Breathe Ventilation System installed. DuraShield and Stablwall where needed. Clean up and haul away debris.